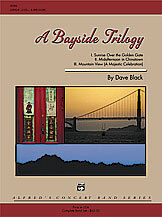 A Bayside Trilogy captures the essence of three well-known areas of interest surrounding the San Francisco Bay Area. The three movements, “Sunrise Over the Golden Gate,” “Midafternoon in Chinatown,” and “Mountain View (A Majestic Celebration),” paint vivid pictures using a variety of orchestral colors and compositional techniques. From a glorious sunrise to a thrilling mountain view, each movement conjures up images that will leave your audience with a musical postcard. Take a trip to the San Francisco Bay Area in your next concert with A Bayside Trilogy.